ProDataSetBinding.p uses a ProBindingSource to bind a ProDataSet to a hierarchical grid. First, the procedure creates the ProDataSet. Then, it creates the ProBindingSource. It binds the grid to the ProBindingSource through the grid's DataSource property. Finally, it sets up some text boxes and binds them to display particular fields from the Customer table. DEFINE VARIABLE rMainForm AS Progress.Windows.Form NO-UNDO. DEFINE VARIABLE rCustInvGrid AS UltraGrid NO-UNDO. DEFINE VARIABLE rCustNumTB AS TextBox NO-UNDO. DEFINE VARIABLE rCustNumLabel AS Label NO-UNDO. DEFINE VARIABLE rCustNameTB AS TextBox NO-UNDO. DEFINE VARIABLE rCustNameLabel AS Label NO-UNDO. DEFINE VARIABLE rSalesRepTB AS TextBox NO-UNDO. DEFINE VARIABLE rSalesRepLabel AS Label NO-UNDO. DEFINE VARIABLE rCommentTB AS TextBox NO-UNDO. DEFINE VARIABLE rComLabel AS Label NO-UNDO. DEFINE VARIABLE rBindS AS Progress.Data.BindingSource NO-UNDO. DEFINE VARIABLE rControls AS Control+ControlCollection NO-UNDO. DEFINE VARIABLE hTTInvoice AS HANDLE NO-UNDO. DEFINE VARIABLE hDataSet AS HANDLE NO-UNDO. DEFINE VARIABLE hBufTTCust AS HANDLE NO-UNDO. DEFINE VARIABLE hBufTTInv AS HANDLE NO-UNDO. DEFINE VARIABLE hTopQuery AS HANDLE NO-UNDO. DEFINE TEMP-TABLE ttCustomer NO-UNDO LIKE Customer. DEFINE TEMP-TABLE ttInvoice NO-UNDO LIKE Invoice. DATA-RELATION FOR ttCustomer, ttInvoice RELATION-FIELDS(CustNum, CustNum). DEFINE DATA-SOURCE dCust FOR Customer. DEFINE DATA-SOURCE dInv FOR Invoice. rBindS = NEW Progress.Data.BindingSource(hDataSet, hBufTTCust, "*", ""). rMainForm:Text = "Customer & Invoice Form". rCustInvGrid:Text = "Customer & Invoice Grid". When this procedure runs, a form appears displaying a hierarchical grid and a simple details viewer, as shown in the following figure. As discussed in Binding to ProDataSets, you might need to display parent and child records in separate grids. MultipleBindings.p binds two ProBindingSource objects to the same ProDataSet to display parent and child records in separate grids. The internal procedure, CustPositionChanged, synchronizes the grids. The main block calls this procedure in response to the ProBindingSource's PositionChanged event. The procedure then synchronizes and refreshes the child grid. DEFINE VARIABLE rCustGrid AS UltraGrid NO-UNDO. DEFINE VARIABLE rInvGrid AS UltraGrid NO-UNDO. DEFINE VARIABLE rCustBindS AS Progress.Data.BindingSource NO-UNDO. DEFINE VARIABLE rInvBindS AS Progress.Data.BindingSource NO-UNDO. DEFINE VARIABLE hCustQry AS HANDLE NO-UNDO. DEFINE VARIABLE hInvQry AS HANDLE NO-UNDO. rCustBindS = NEW Progress.Data.BindingSource(hCustQry, "*", ""). rInvBindS = NEW Progress.Data.BindingSource(hInvQry, "*", ""). /* When Position changes in CustGrid, synchronize and refresh InvGrid. DEFINE INPUT PARAMETER rSender AS Progress.Data.BindingSource NO-UNDO. DEFINE INPUT PARAMETER rArgs AS System.EventArgs NO-UNDO. 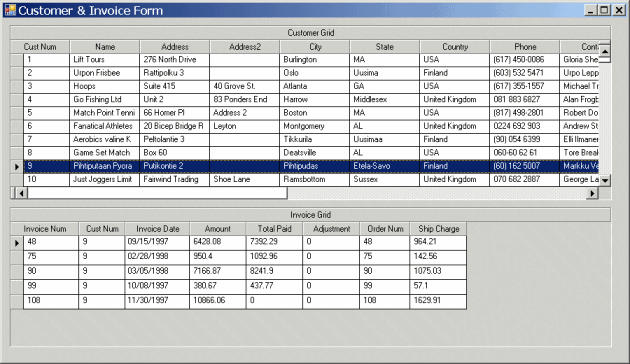 When this procedure runs, a simple form appears displaying a customer grid and an invoice grid, as shown in the following figure.